The history of evolution is filled with great pronouncements about how a new fossil find finally provides the “missing link” in some evolutionary transition. Of course, such missing links are generally found to be hoaxes or misinterpretations. Interestingly enough, however, the publicity related to the original announcement is generally significantly greater than the publicity of the fact that the original announcement was wrong. Darwinius masillae is probably the most egregious example of this general trend. It was billed as one of the most important fossil finds in history, a “missing link” that would challenge everything we knew about human evolution. This little creature is going to show us our connection with the rest of all mammals. The link they would have said until now is missing, is no longer missing. As is the case with most evolutionary hype, it turns out that all of this nonsense is just completely wrong. Many lines of evidence indicate that Darwinius has nothing at all to do with human evolution. The mammalian order Primates is divided into two orders: Strepsirrhini and Haplorrhini. Humans, tarsiers, monkeys, and apes are a part of the suborder Haplorrhini, while lemurs, lorises, and other similar mammals are part of the suborder Strepsirrhini. The article in the Journal of Human Evolution uses multiple lines of evidence to show that Darwinius masillae belongs in suborder Strepsirrhini. This, of course, puts it far from any relationship to humans. What’s amazing about Darwinius is, despite the fact that it’s nearly complete, it tells us very little that we didn’t already know from fossils of closely related species. So this fossil, which was supposed to be one of the “most important fossil finds in history” actually adds very little to our understanding of, well, anything. Do you think Sir David Attenborough is rushing to make a new documentary telling this to the world? I rather doubt it. Because many evolutionists do not operate scientifically, they often make grand claims that are based on little but their fervent faith in evolution. However, after so many examples of these grand claims being demonstrated false, you’d think they might learn to be at least a bit more circumspect. I guess some evolutionists’ religious fervor just knows no bounds! Thanks for posting the link with the story about homeschooling. The author of that article, Dylan Lovan, contacted me a couple of times, but I didn’t know he had finished the article and published it. Amanda, regarding the link about the asteroid wiping out the dinosaurs: it is amazing how close this is to the way many churches operate. A group of “experts” got together, looked a the data, and made an official pronouncement about the “truth.” Now that the “high priests” have made their final decision on what wiped out the dinosaurs, we MUST agree with them. That’s the end of the story. I am glad that I choose to think for myself. Of course, that’s the hard road to follow. Most people take the easier road – they let others do the thinking for them and just believe what they are told to believe. Dang!!!!!!!!!!!!! Someone beat me to it! I found out through Jerry Coyne’s blog (I wouldn’t be mad if he’s your 2nd favorite atheist, but I won’t go lower than #3, four horsemen be damned, oh wait, they already are), Why Evolution Is True, and was happy to find an earlier post on Apologia as well. The comments to this earlier post are a must read as well. Several home schoolers, parents and students, commented. #10 warmed my heart: “Apologia is well-written but ridiculous.” What a coincidence we were just talking about ridiculous! What are the chances of that? Incredibly high – thus it could never have happened. On the AP story itself, great headline and quote, congratulations! I agree, you certainly know your demographic. Give ’em what they want, and you’ll be rewarded in sales. You and Bob Jones, top home-school texts! You should be so proud. I do beg pardon for rambling on so, I’m almost giddy right now. Shooter, I am glad that I could make you giddy. It’s unfortunate that I can’t make you follow the data! That’s something you have to decide to do yourself, and clearly you aren’t interested in doing that. Of course, here are some from Apologia’s site as well. I know that it makes you sleep better at night to think that creation science isn’t science. However, if that were the case, students who use my creationist texts wouldn’t be CLEPing out of biology and excelling at university. Norwegian Shooter, the quote from Dr. Wile seems to be out of context, I think. It is probably an instance of quote mining, an activity of purposeful deception of which creationists are often accused. Dr. Wile, it never ends, does it? I see this type of debate on practically every forum. People who parody. People who explicitly mock. The one side which acts triumphant since is it socially acceptable. The one which is called ignorant by people who don’t even know what the word “ignorant” means, much less how to properly use it in a sentence. It’s been going on since the time of Cicero, and it will probably go on until the end of time. Try not to let them get to you. I’ve listened to your testimony on cassette a few years back and know some of the things you had gone through, but the onslaught of antitheistic fervor seems to never die down and it can be discouraging at times. Sometimes I debate online, but after a time I get fatigued by all the rampant name calling and elephant hurling. You have helped me out with your book Reasonable Faith as well as your chemistry and physics textbooks. I hope others continue to benefit from the work you did, and even now on your blog also. It seems like such debating and arguing may never end, but it is good to keep ones voice present as you are. Michael, the quote is definitely out of context and truncated. The reporter asked something like, “Why are all the science books for homeschoolers written from a Christian perspective?” The quote was the FIRST PART OF my answer. The second part was something like, “and once I find out the demographic, if I am not a creationist, I won’t end up writing for that market.” So my point was that the market is self-selecting. Evolutionists won’t write for it, and creationists will. As you suspected, the reporter did what creationists are routinely accused of (but rarely do). He took a quote way out of context and then truncated it so that it would fit into the “template” of his story. The quality of this reporter’s work this article can be easily judged by the absurd errors he makes. I have NEVER been a professor or lived in Indianapolis. My biography is posted all over the place, and he actually spoke to me. Nevertheless, he can’t get even that simple fact correct. Also, Calvert School goes up to eighth grade only. Thus, it is not even relevant to the discussion, which is on high school biology texts. When the reporter can’t even get simple facts correct, you know his treatment of any complex issue is going to be worthless! You are certainly correct that people have been mocking others throughout history. It is the common technique of a person who cannot really back up his arguments. Shooter, for example, rarely makes a post without making several errors. He tenaciously holds on to those errors until the mass of data overwhelms him, then he resorts to mocking or changing the subject. I actually don’t mind the mocking, because it shows how his position is not based on reason. Instead, it is based on blind faith. I know the quote is mined, but all’s fair in love and journalism. I also admit to explicitly mocking, but this was just too good to pass up. Dr Wile knows I love him. I know they’re probably going to talk like that anyway, but I really don’t want to make any errors. I want spotless arguments. But it seems like those take forever to compose…sigh. What do those fossils actually look like? Amanda, you should always strive for accuracy in your blogs, but you shouldn’t do it because a group of ignorant people are writing about you. Ignorant people will display their ignorance by disagreeing with anything that contradicts their preconceived notions, no matter how factual it is. Evolutionists claim that it is a transitional fossil because it is possible that it walked upright. However, later studies show that the fossil has the characteristics of a knuckle-walker (Brian G. Richmond and David S. Strait, “Evidence that humans evolved from a knuckle-walking ancestor,” Nature 404:6776, 2000). Most evolutionists explain around this new evidence by claiming that the knuckle-walking characteristics had not yet “evolved away,” even though Australopithecus was mostly walking upright. Even more examination has caused some to suggest that Australopithecus is not even a part of the human evolutionary line (Yoel Rak, Avishag Ginzburg, and Eli Geffen, “Gorilla-like anatomy on Australopithecus afarensis mandibles suggests Au. afarensis link to robust australopiths,” PNAS:104:6568-6572, 2007. Labeling a fossil as “transitional” does not make it a transitional fossil. The evidence must show that it is a transitional fossil. Those who blindly accept the words of the high priests of evolution think the label makes it so, but those of us who actually examine the evidence know better. Another thing that article does, which one would expect of a deceptive website, is start off with a list of transitional forms between species and genera. Now this is supposed to be an article about transitional forms that creationists claim do not exist. However, most transitional forms between species and genera are not disputed by creationists, as they represent cases of microevolution, which is a well-documented, well-understood process. Indeed, most creationists use microevolution to explain the rapid diversification of creatures after the Flood. Thus, the article gives the appearance of many transitional fossils that creationists claim do not exist. However, almost half of them are transitions that creationists don’t contest. They are also transitions that are irrelevant to the concept of evolution that talkorigins is trying to promote. The rest, like Australopithecus, are only transitional forms in the faith-filled mind of a fervent believer in evolution. That’s cool that you actually don’t mind the mocking. Sometimes I have a difficulty with that, when they get too personal and such. Shooter doesn’t seem so bad compared to others in forums, but qualitatively he is the same. The method of resorting to ridicule or changing the subject is quite common. Militant atheists on forums especially seem to never admit when they are wrong on an issue, but just go by the above method. Then later, they’ll reuse the item they were shown to be wrong about as if no rebuttal had been provided. Some of them really seem to have ears of stone but mouths like foghorns. I really like, “ears of stone but mouths like foghorns.” That describes a lot of people I know! I actually find it oddly flattering that they took any time to bash me. Also, the fact that they spent more time making fun of my writing skills than critiquing my facts is quite revealing. My initial reaction to it was a combination of feeling like I need to write more articles on those subjects, and feeling hesitant – worried that if I write I might mess up and make things worse. But I’m not bothered by it so much now. I’ve started with a satirical article http://amandaread.com/?p=1459 about those news headlines, and will try to respond to the comments on my blog over Spring Break. Amanda, you should not let such nonsense affect your writing in any way. You should write as much as you want to write – no more, and no less. You are a very talented writer and you make great points. That’s why your detractors have to resort to mocking instead of writing intelligent responses. You should not let their ignorance affect you in any way. I find that this entry is very misleading. So you quote hyperbolic language from a news organization and a documentary. I can quote you hundreds of scientists from the day that this fossil was revealed who were extremely skeptical about it. You’re establishing a false argument because you fail to quote from a single scientist speaking of his own volitional expertise, then extrapolating that to “many evolutionists” in order to cry foul. But “many evolutionsts” (most) were circumspect about the entire thing. The discovery of the 95%-complete ‘lemur monkey’ – dubbed Ida – is described by experts as the “eighth wonder of the world”. “This specimen is like finding the Lost Ark for archeologists,” lead scientist Jorn Hurum said at a ceremony at the American Museum of Natural History. “This is the first link to all humans … truly a fossil that links world heritage,” said Dr. Hurum. “It’s really a kind of Rosetta Stone,” commented study co-author Professor Philip Gingerich, of the Museum of Paleontology at the University of Michigan. Now I agree with you that SOME evolutionists were being circumspect about the find. However, the leading outlets, including the scientific ones, were trumpeting its importance loud and clear. 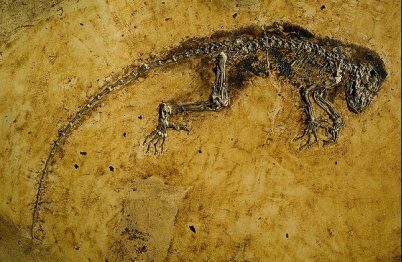 did the evolutionists who were skeptical about this one fossil get much media attention? Did they have any documentaries produced about this? Basically, when there is a claim supporting the evolutionary story made it gets positive publicity; when a claim is made contradicting the evolutionary story, then one of three types of publicity are given to it: negative, meager,or none. Ben, your comment to Jacob is right on the money! Two of your quotes are from people on the team, while the other comes from vague “experts”…which essentially means those behind the entire marketing machine. Your point rests on people who clearly have a vested interest to trump the thing up. Furthermore, on top of scientists like Jerry Coyne and PZ Myers expressing skepticism, you have articles from Nature, Time, and the Guardian featuring bountiful quotes from other scientists who themselves are skeptical. Even scientists who were excited about it, like Ken Miller, were merely saying that it could add to our understanding. Most scientists divested from the actual reciprocal effect of the fossil were not making such grand claims. And here I’ll bring Ben Michael Fournier’s point into context. For one, 99% (that is a real figure, by the way) of biologists already consider evolution a proven fact with or without Ida. They would consider it disingenuous that any known fact can once and for all disprove evolution. Sure, groups can release their Expelleds, but you might as well claim that the media should give room to those who try to disprove general relativity. Despite that, they still give ample room for creationist articles. Ida does contribute to our understanding, however. It does fit within the evolutionary framework. If a crocoduck is ever discovered, then that will get ample media attention too. Or if it’s proven that a rabbit ever existed in the Cambrian, then there would be a media fervor so large that Darwin himself would be rolling over in his grave. But these things don’t happen, so you can’t argue about a double standard. Jacob, those are the quotes that were widely reported (by non-science AND science outlets), so they are the ones relevant to the discussion. The fact is that Ida came on the scene and, to anyone watching the news or even the general science outlets, she was supposed to change everything. Now that we know she adds very little to the discussion, there is no loud trumpeting anymore. That’s the point, and even though you don’t want to admit it, it is the truth. Evolution is filled with loud trumpets of supposedly great findings, and when the findings are shown to be not what the evolutionists wanted, they are quietly ignored. You would have to give me the reference for your “real figure,” as I have never seen a scientific survey of biologists. A 2008 survey of high school biology TEACHERS indicated 16% believe “God created human being pretty much in their present form at one time within the last 10,000 years or so.” However, even if 99% of biologists believe in evolution, that’s not important. We don’t do science by majority vote. We do it by the data. The majority of scientists have often been wrong in the past. Sure Ida fits in the evolutionary framework if you force her to. As biologists have shown over the years, nearly anything can be forced into an evolutionary framework. It just takes a lot of special pleading. However, she looks like a typical lemur-like animal which is quite distinct from human beings. That’s essentially what the latest studies tell us, and it is what creationists said from the beginning. It’s nice to see that the evolutionists have finally caught up to the creationists on this point. Now you’re playing the same game. You’re decrying the posturing, yet using the posturing to support your position. Your point is about evolutionists as a whole, yet you’re using select quotes to hang them. Most of the evolutionists were on the same page as you. They were skeptical that this was some kind of monumental find. How can you disparage them for something that you would agree with, at least in the sense that it shouldn’t have been turned into a big deal? They cannot stop what a small group of scientists chose to do. Creationism has had its fair share of hoaxes too. If we want to argue about it, then I could say that creationism is just bad science to begin with, which is far worse. The 99% figure came from a paper, actually. Gallup did a later poll that found only 5% of any kind of scientist was identified as a creationist. Another one found that 74% of all post-graduates believed in evolution. The more people are exposed to the data, the more likely they are to believe evolution. No, majority does not rule, but with just about any other theory, such a large majority comes as a result of rigorous testing. It comes as a result of the data. “The majority of scientists have often been wrong in the past” is not a good explanation. The theory of evolution has stood for 150 years, and it has only gotten more robust at offering biological explanations. I don’t believe that there has been another theory that has accrued so much data and then been overturned. Just like gravity needed Newton to explain it and Einstein to make sense of it, and now presumably someone to explain it at the quantum level, evolution itself is an undisputed fact, and we then need to fill in some of the details of how it happened. At this point, it is incredibly hard to see what fact could come along to disprove it. We have studied the mechanisms of evolution quite well. We have seen new species arise in nature. And the fossil record offers overwhelming evidence for it. Ida fits nicely with the Adapid group that we already know about. It does not go against any current knowledge. On the other hand, some creationists are still denying the abundance of horse and whale intermediates that we do have. And some are still trying to play off human ancestors as something other than what they are. Evolution has allowed scientists to make exact predictions about the kinds of fossils that we should find: Tiktaalik, for instance. We even knew exactly where to look based on where it would fall in the fossil record. If a fossil did not fall in line or is so strange that it flouts all classification, then evolution has some explaining to do. So again, where is the crocoduck? Where is the rabbit in the Cambrian? Jacob, I am not playing the same game. I am comparing apples to apples. You want me to compare apples to oranges, because that’s not as embarrassing for evolution. However, I must compare apples to apples. The news and science outlets TRUMPETED that Ida would change everything. They also IGNORED the evolutionists who thought otherwise. Now that we know Ida doesn’t add much of anything to the discussion, there is no trumpeting. If evolutionists wanted to be honest, they would trumpet their failed predictions what what Ida meant. They will not, because they know that being honest drives people away from evolution. I notice that you continue to refuse to give references for your numbers. Not surprising. “The majority of scientists have often been wrong in the past” is, indeed, a good reason to not put much stock in what the majority of scientists say about any issue. After all, why put your faith in something that has been demonstrated to be so wrong in the past? Instead, look at the data. That’s where you are more likely to find the truth. The data certainly do not support evolution, so the majority of scientists do not believe in evolution because of the data! Indeed, far from becoming more robust over time, evolution has become weaker and weaker over time. That’s why so many scientists are publicly stating their opposition to evolution. The more data that come in, the worse it is for evolution. The fossil record is a great example. Back when we didn’t have many fossils, it was reasonable to assume that a continuous, “tree” pattern would arise from the fossil record. The more fossils we find, the more discontinuous the fossil record appears, and the more predictions of evolution are falsified. As a result of a fossil record that is pretty much the opposite of the predictions of evolution, evolutionists have had to come up with wild scenarios like punctuated equilibrium just to “explain around” how the data contradict the hypothesis. Tiktaalik is a great example of the way the fossil record falsifies the predictions of evolution. Scientists looked at the rocks where they THOUGHT the transition from fish to amphibian happened, and they found Tiktaalik. It was trumpeted as the “missing link” in the fish-to-amphibian transition. Of course, further analysis showed otherwise, but you didn’t hear that trumpeted. Now we know that Tiktaalik is NOT the missing link, because we have strong evidence of tetrapods in rock that supposedly represents times BEFORE Tiktaalik. So what you claim is a successful prediction of evolution is actually a FALSIFIED PREDICTION. You really need to keep up on science if you want to avoid embarrassing yourself with your comments! Who? Who are you talking about? The media? It’s their job to trumpet stories. They don’t have to apologize for anything. After all, many of them were just repeating what the team said. Scientists? Most scientists were not making this out to be a revolutionary find. You keep saying evolutionists, but who? Your claim is incredibly contradictory. You admit that many were skeptical of it, but you want them to apologize for it? The claims were made by a select group of people who stood to benefit from the find. Most scientists mollified any praise, if they did not express outright skepticism. Why do you want them to admit to something that they didn’t do? In fact, most scientists hate the word missing link. It would also not be a wild assumption to say that the rate would be higher amongst biologists, so the 99% figure is probably very close to the truth. It still fits very well within an evolutionary framework. You may say that anything can fit within an evolutionary framework, but this isn’t true because it’s exactly what evolution allows for. Once again, we see this very thing today. Apes resemble our last common ancestors more than we do. It’s also very revealing that we’re only talking degrees. We would expect to find organisms closely related (in millions of years) to others. Sure, they’re different in a few bones here, a few bones there, but they’re remarkably similar. What we don’t find is an organism with a super brain and wings made out of cotton candy. If we did, then evolution would have some explaining to do. But organisms like Tiktaalik are easily accounted for by the slow evolution in millions of years of branching lines. On account of the fossil evidence, what does creationism predict? It’s not enough to say simply that there are a lot of missing fossils because the fossils that do exist require an explanation. Why, for instance, do we have a robust set of fossils for the evolution of mammals http://en.wikipedia.org/wiki/Mammal_evolution? Why do we have a set of fossils that show the evolution of whales down to the changing position on the blowhole? Why do we have human ancestors and can pinpoint with some detail such things as when they began to lose hair or when the brain began to enlarge? Why do we have entire ancestors for orders like Carnivora? And what about on the genetic or phenotype level? Why do humans have genes that would code for egg yolk? Why do whales have hind limbs? And why does the fossil record rest in an order that clearly shows an evolution of species (once again, no rabbit in the Cambrian)? How does any of this make sense within a creationist framework? As for scientists being wrong, I suppose that such a question will be answered upon the strength of these arguments, but it’s hard to see how it’s the scientists in the wrong when people like Luskin misrepresent basic facts and doesn’t understand certain elements of modern evolutionary theory. I asked what major theories get totally eradicated after 150 years in which we gain a deep understanding of the field in the interim, but I’ll make an easy prediction: anybody who says that evolution has major problems misunderstands the science, and the theory will only continue to grow stronger. I am talking about the people who trumpeted the find. Come on, Jacob, this is not rocket science. I have quoted them. They are evolutionists, and they made the claim, and they were the ONLY ones whose claims were widely publicized. Now that we know Ida adds very little to our knowledge, NO ONE is trumpeting that. This is typical of how evolution is communicated to the general public. I don’t want those who were skeptical of Ida to apologize. I want those who trumpeted Ida and now are silent about it to apologize. Once again, this is rather simple, Jacob. So…you really don’t have a reference for your “real figure.” You even admit you “don’t know” how they arrived at the estimate. Thus, you simply read something you liked and believed it, with no evidence. No wonder you are an evolutionist! 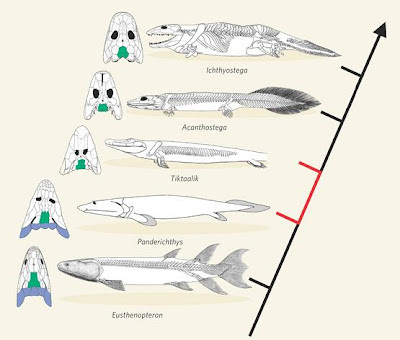 It also seems you can’t read a simple discussion of Tiktaalik, as the point of Luskin’s story is that Panderichthys has more tetrapod-like fins than Tiktaalik. Thus, just as was the case with Ida, despite all the trumpeting, Tiktaalik doesn’t seem to add much to the discussion. You are correct that “anything can fit within an evolutionary framework.” That shows how useless evolution is as a scientific paradigm. Ptolemy’s view of geocentrism could fit anything, as long as enough epicycles were added. That’s exactly where evolution is today. Add enough epicycles, and it can accommodate anything. Creationism predicts exactly what we see in the fossil record – an “orchard” of trees, each tree representing a created kind. Evolution, on the other hand, predicts a single tree, and the fossil record has falsified that in no uncertain terms. We don’t have a “robust” series of fossils showing mammal evolution. Instead, we have a collection of hard-to-interpret fossils that only show evolution if you FORCE them to. The same can be said for the pitifully small number of fossils that evolutionists claim demonstrate whale evolution. The same can be said for the absurd claim that the fossil record demonstrates human evolution. Humans don’t have genes that code for an egg yolk. They have sections of DNA that LOOK SIMILAR to genes that code for egg yolk. These genes are ASSUMED by evolutionists to be ancestral genes that have been “turned off” by mutation. However, that is not the only explanation for such genes. In a creationist view, regions of the DNA called “pseudogenes,” which is where you find things similar to egg yolk genes, have a serious regulatory function. The genes you claim are egg yolk genes are, in fact, pseudogenes with regulatory functions most likely related to metabolism. Whales don’t have hind limbs. They have pelvic bones, and as anyone who has studied whales in even a cursory way knows, they exist for a very specific purpose. They support and protect the genitalia. You really need to learn more about these things before you start posting such nonsense. The fossil record makes MORE sense in the creationist framework, as the fossils show the clear progression of a worldwide Flood. Thus, the creationist framework doesn’t expect a rabbit in the Cambrian. The fact that you repeat such a silly statement so many times shows you really haven’t investigated this issue at all. Because the layers of rock represent ecological zones rather than long eons of time, many things that are puzzling in the evolutionary framework (misplaced fossils, fossils that were thought to be extinct but are now known to be alive, etc.) are not at all puzzling to the creationist framework. While you claim that “anybody who says that evolution has major problems misunderstands the science, and the theory will only continue to grow stronger,” it is exactly the opposite. As the data clearly show, anyone who thinks there aren’t major problems with evolution doesn’t understand the science. You can close your eyes, cover your ears, and yell “evolution is a fact” as much as you want. However, the data clearly say otherwise, which is why so many scientists are leaving evolution.